Local restaurants and cafés serving up delicious regional produce. Not only is McLaren Vale an internationally acclaimed wine district, the town also offers beautiful scenery, with local restaurants and cafés serving up delicious regional produce. Just 40 kilometres from Adelaide, McLaren Vale is nestled between the Mount Lofty Ranges and the beaches of Gulf St Vincent, and is the perfect base to explore the region's many cellar doors. Wander the main street looking around the art studios, galleries and shops along the way, indulge your sweet tooth at Medlow Confectionery (famous for FruChocs) or head off on the McLaren Vale Cheese and Wine Trail. To get a feel of the countryside, walk or ride the eight-kilometre Shiraz Trail beginning adjacent the Visitor Information Centre and meandering through to the township of Willunga, passing via vineyards, wild olive groves and old gum trees. The McLaren Vale wine region is rich in history, with the first vines planted by John Reynell in 1838, two years after the proclamation of the colony of South Australia. As early as 1850 the historic Hardy and Seaview wineries were in operation, and it is widely accepted that Thomas Hardy's purchase of the Tintara vineyard in 1853 marked the symbolic beginning of the town. In the early 1800's when the region was being established, before the introduction of grape vines its main agricultural trade was in fact cereal crops. 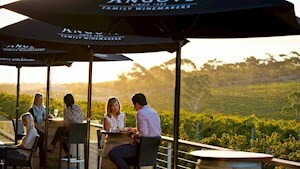 See what people are posting about McLaren Vale. On the road between McLaren Vale and Kangarilla, the McLaren Flat township is where the Adelaide Hills come down to meet the vales. These days Willunga is identified by almonds (make sure you come to the annual Almond Blossom Festival in late July) and increasingly vineyards and olives, which have taken over from the original industries of wheat and mixed farms. So many awarded winning wines to choose from. Now you can enjoy craft beer, spirits and gin. Five Visitor Information Centres are spread across the Fleurieu Peninsula. Each has a dedicated team of locals and resources to support you during your stay. They can provide you with assistance in booking your trip, planning details for your visit, or give advice on what is happening in the region during your stay.